A reimbursable expense is a cost you incur on behalf of a customer. Travel expenses and special materials or supplies are examples of common reimbursable expenses. When you bill your client, include these costs on the invoice so that they can reimburse you. Create an account for your reimbursements. On the left-hand navigation menu, click Accounting, then Chart of Accounts. Once the Chart of Accounts page is up, click Add an Account. In the pop-up window, select the Income tab, and in the search box, enter ‘Reimburse’. Click on the Reimbursed Expenses account that you see, and then Save to finalize the creation of your account. If a Reimbursed Expenses option does not populate, you can choose any Income Account and rename it to your preference. Next, create your invoice. On your invoice, the reimbursable expense you’re recording will be a product line item, just as any product or service you would add. 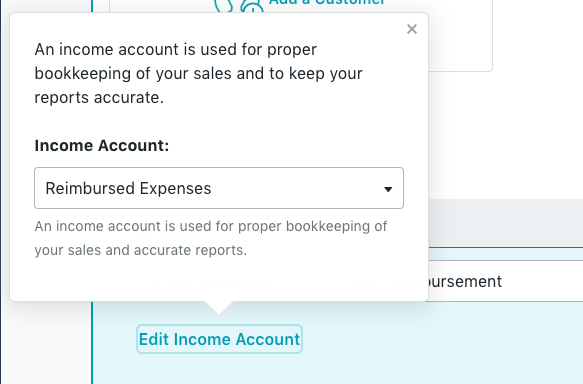 When you add the reimbursable expense line, be sure to click Edit Income Account, and select the Reimbursable Expenses account we created in Step 2. In the example below, this is the Travel Expenses line item. You can include the specific details of your reimbursable expense in the product description. Finish creating your invoice as normal. Add any other products, your customer’s details, and any additional information you need to include. Let’s take a look at Travel Expenses on the invoice in the above example. This initial expense was $100, which you paid in cash. Go to Accounting > Transactions. From the top, select Add Income. Once you have added a transaction, enter the amount (-$100), the category (Reimbursed Expenses), and the account (Cash on Hand). The amount you’ve entered will be in red and a negative, because you have input an expense to your Reimbursed Expenses income account. If you’d like to double check to ensure you’ve entered everything correctly (never a bad idea!) you can head to your Reports tab and open an Income Statement. You should see 0.00 for Reimbursable Expenses if all is well, because the income from the invoice you created and the expense entered on the Transactions page offset one another. Create an account for your reimbursements. On the left-hand navigation menu, click Accounting, then Chart of Accounts. Once the Chart of Accounts page is up, click Add a New Account. In the pop-up window, select the drop-down for Account type, and in the search box, enter ‘Other Income’. 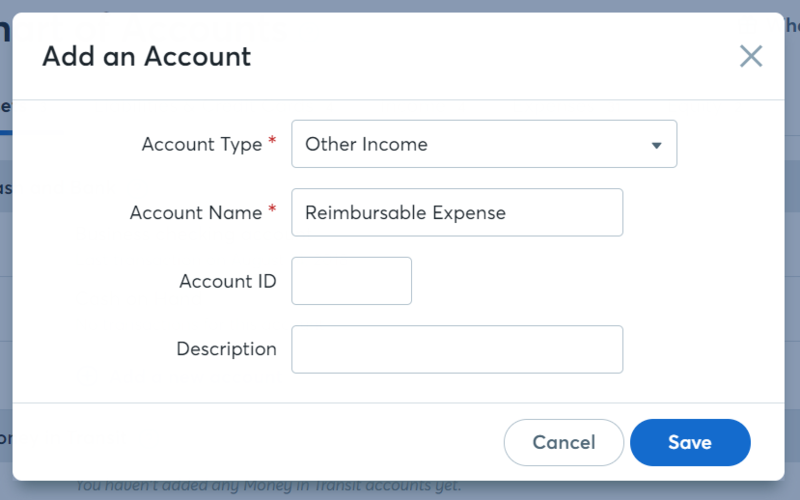 Click on the Other Income account that you see, and then enter the account name as Reimbursed Expense; click Save to finalize the creation of your account. Create your invoice. On your invoice, the reimbursable expense you’re recording will be a product line item, just as any product or service you would add. When you add the reimbursable expense line, be sure to click Edit Income Account, and select the Reimbursable Expenses account we created in Step 2. You can include the specific details of your reimbursable expense in the product description. Go to Accounting > Transactions. From the top, select Add Expense. In the new window, enter the description, account (Cash on Hand), amount ($100 as a Withdrawal), the category (Refund for Income > Reimbursed Expenses – try the search to find it faster). If you’d like to double check to ensure you’ve entered everything correctly (never a bad idea!) 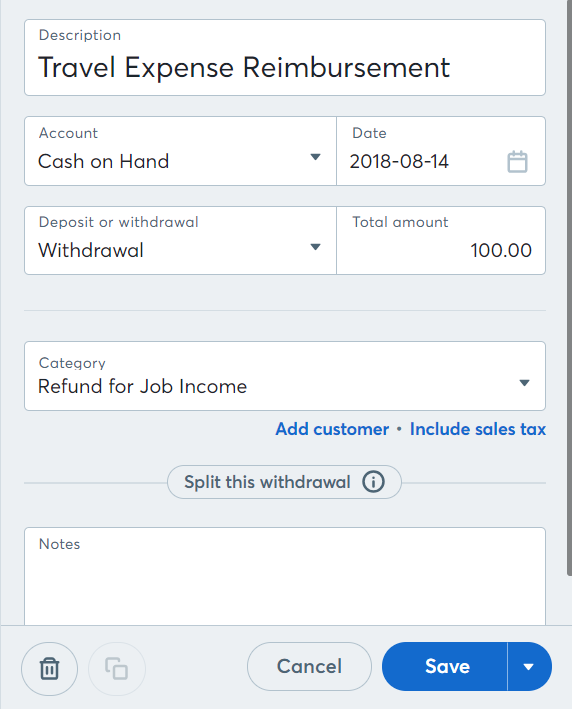 you can head to your Reports tab and open the Account Transactions report; then, from the account drop-down select the Reimbursed Expense account. You should see 0.00 for Reimbursable Expenses if all is well, because the income from the invoice you created and the expense entered on the Transactions page offset one another.